Happy February! We're bringing the day in with a minor snow storm, and several more in the near future are predicted. 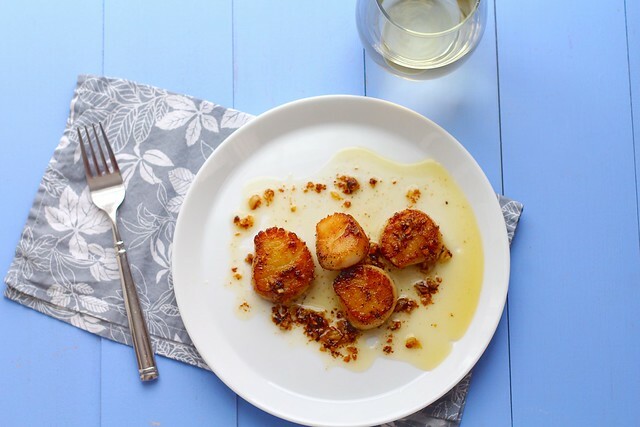 Since it's currently scallop season in our area, and since people generally start gearing up for Valentine's Day menus, I thought this recipe would be perfect to share now. If you are a long-time reader, you will know that I do not like any form of seafood. Whenever people hear I am from Maine, and I am married to a lobsterman, they always ask if I eat a lot of lobster. I have definitely seen some minds implode when I tell them I don't like seafood. Like, at all. But, my husband likes seafood. Well, some of it. (He doesn't like lobster either!) One winter indulgence he loves, are scallops. In between the crazy wind and weather, he managed to go scalloping a few weeks ago. The area is closed to any new commercial licenses, but you can go recreationally with a limit for each day. So, my husband caught some scallops for himself and as a Christmas gift for his uncle. Since my husband takes the time to go catch scallops in the middle of winter, I guess, in return I can take the time to cook them. Ha! I generally try them, just to make sure my taste buds haven't changed. So far, they haven't, unfortunately. Even though I don't like scallops, my husband claims this is one of his favorite ways I prepare scallops. I decided, despite my personal tastebuds, it was long overdue for me to share this recipe. Especially when they were caught by my own husband and cooked the same day they came out of the sea. This is a very simple recipe, but it yields wonderful taste. My husband prefers the scallops to be cooked all the way through, but you can cook them to your taste. As always, be sure to use fresh caught, not farm raised seafood when you cook! Fresh caught always yields better results, and it's a lot healthier for you. Serve this up for your loved one this valentine's day, or just as a treat for yourself. In a small saucepan, put 2 tablespoons of butter over medium heat. Let the butter melt. Once completely melted, turn off the heat. Skim and discard any solids off the top. Transfer the now clarified butter to a large saucepan. Pat the scallops dry on both sides with paper towels. Season both sides of the scallops with salt and pepper. Set aside. In a small bowl, combine the room temperature butter, chili sauce and garlic. Season with salt and pepper. Mix together until combined. Set aside. Heat the saucepan with the clarified butter over medium heat. Add the scallops to the pan in a single layer and let cook without flipping or stirring for 2 minutes (if you want to cook the scallops all the way through, increase cooking time to about 8 minutes per side, depending on how thick the scallops are). Flip the scallops over and cook for 1 to 2 minutes more, just until cooked through. Remove the scallops to a plate. Whisk the wine into the now empty saucepan to scrape up any browned bits from the bottom. Reduce the heat to medium-low. When the wine has mostly cooked off, stir in the chili butter mixture. Whisk just until melted. 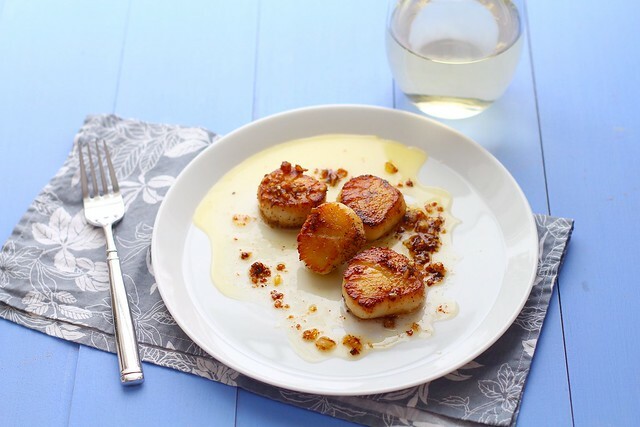 Serve the scallops warm with a drizzle of the butter mixture over the top.